Specs also have some explanation how 720 and 1080 modes work. I hope this is a MAR sensor, or they develop one for the next GH camera. 19mmx10.7mm is about the ideal sensor size in 16x9. 17.6mm would just be slightly larger than the GH3. Oink! Aspect ration 4:3. Hope to see it in a camera, and the "low noise" part seems very interesting. @Vitaliy_Kiselev do you think you can jack it before christmas? Edit: And how much, of course. What's with that magic number ~8MP? Are you suggesting they are sampling half the lines and binning 2x2 on FHD and 3x3 on HD? The sensor specs say: Full scan mode (No mixture, No decimation) and also (Full scan, Any size cropping) so I was believing this was a full bin from 16MP and not from 4K (8MP). Binning is still required for 12-bit sensor output. For 10-bit output the full sensor can be read at 22.5fps, which would equate to ~24fps with the crop from 16:9 aspect. So I think 4k/24p is possible to create from 16:9 full sensor read-out. 4k/30p would still require binning even with 10-bit. By idea restriction lies in subLVDS speed. And it allows to read at higher than 22.5fps even for full sensor. Andrew said in eoshd that the specs are very similar to the GX7 sensor. @MarcioK, @Vitaliy_Kiselev Voldemort could be right. The GX7 sensor and the (new) MN34230PL have quite some similarities. So in my dream the GX7 with hack, will be a real competitor for BlackMagic Pocket?! If the sensor is slightly larger than the GH3, the extra pixels might be for the built in IS, but I hope a MAR is in the works. GX7 is likely hardware limited by processor and subLVDS for 4k. @tomson8877 Only if a hack could enable raw recording. But higher bitrates could already be an improvement. The sensor's parameters look very promising. I'm wondering what was the sub-LVDS data transfer rate for the previous Panasonic micro43 sensors? Does this mean that the camera could be capable of 22 FPS 10 bit RAW burst mode for still images? Even 14.7 for 12 bit images wouldn't be that bad. This definitely would be class leading especially if this is a true global electronic shutter or at least a rolling one that reads out so fast it is indistinguishable from a GES. I find it hilarious that they're coming out with 4k pro-sumer cameras and TV's right and left when the broadcast A/V standards for UHD have not even been ratified and set in stone. Talk about being on the bleeding edge. 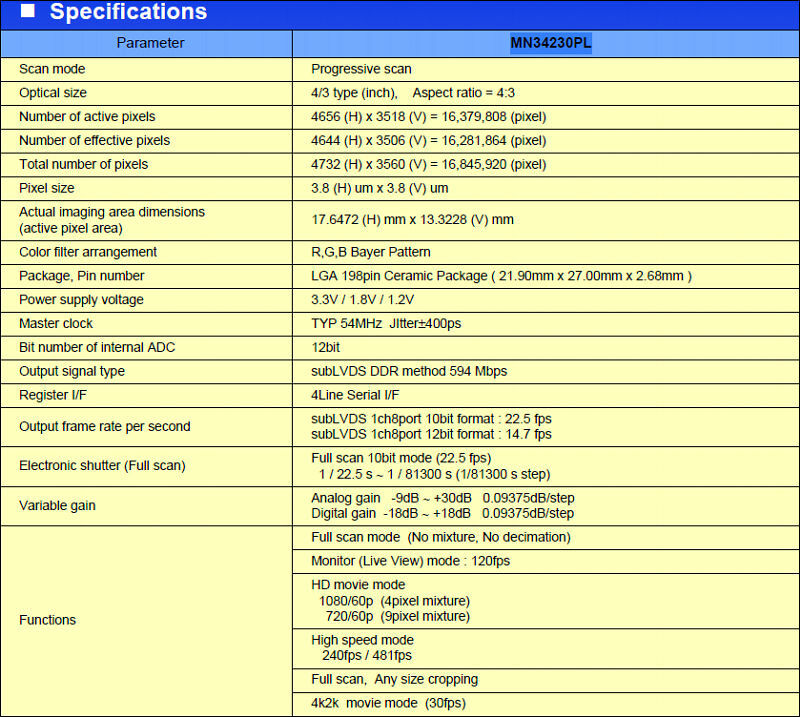 HDMI 2.0 was ratified earlier this year, and now they need to modify the chipsets yet again because the specs. don't cover all the bases. They got the cart before the horse on this one. The industry is falling all over itself and 4k may end up like digital 3D for the home... a certified disaster... unless they get their act together. @JohnTollwannabe I understand what you are saying but I think many of us are looking forward to these larger resolution sensors for more latitude in post. Not necessarily to take 4K videos of cats and children :). Just going up to the BM 2.5K camera helps tremendously with things like re-framing, stabilization and zooms. And don't forget the amazing 1080p or 2k image when you scale 4k source material down. I think capturing 4k source material and consumer consumption of 4k are two different animals - as was proven, most people can't tell the difference between 2k and 4k in most normal viewing conditions, but many CAN see the difference between 2k source material at 2k and 4k source scaled to 2k. Yep, would like 4K to downscale for final output quality, and if you down scale within a higher bit depth space (such as 16-bit) you'll get a higher precision bit depth than the capture source, better image vs 1080p that wasn't perfectly scaled down in-camera from a higher res sensor, and improve colour resolution if sub-sampling was applied. The broadcast and streaming specs for Ultra HD ("sorta" 4k) may or may not include an entirely new color gamut spec. : ITU-R Rec. 2020 (currently HD uses Rec. 709). They're also still debating if the video bit depth will be increased to 10 bit or 12 bit and 4:2:2 or 4:4:4 component bandwidth (or going even further). Another possible advancement are theatrical whole frame rates (24, 25, 30, 48, and 50 and not just video friendly rates like 23.97, etc. for better motion cadence), and increased frame rates to 60 or even 120 fps. I haven't even started on the new audio format requirements (there is some rumbling that object based/metadata controlled audio bitstreams, rather than the traditional channel-based formats, may make an appearance, with DTS leading the charge along with a group of vocal audio insiders. The studios and audio post engineers from major audio companies are already trumpeting object based audio with Dolby Atmos (a hybrid channel/object format) because you can scale to virtually as many "channels" as you have speakers hooked up to a compatible surround processor. You only need one master object mix that can be easily down-converted to any previous format. Pioneering Japanese broadcasters have talked about using surround layouts of up to 20-some speakers and are getting ready or perhaps already transmitting these prototype audio bitstreams along with various versions of UHD and 8k programming. They're usually the Guinea pigs for proposed worldwide TV and video systems. I'm not talking about professional grade camera and TV monitoring gear because their capabilities are so far ahead of consumer level products and are specifically designed for archival mastering or theatrical distribution. We have this story covered in 4K topic in News. I think they themselves do not know that they want. Looking at broadcasters and constant cutting of TV frequencies to adapt LTE that brings more money I can say that no 10 or 12 bits are coming. Most probably it'll be 24fps and may be 50-60fps but with very low bitrates. Same goes for color space. As if you use old 709 one it look ok for most people on wide gamut TVs, but if you will go to wide gamut on all normal TV's it'll look really dull. I would assume that the final specs. would have some means to down-convert Rec. 2020 to earlier gamut scales on a current HDTV, otherwise Blu-ray's Rec. 709 wouldn't work on regular SD TV's... if you still have a player that can output composite SD resolution, that is. From what I gather, they're hoping H.265 will be some sort of panacea (and is supposed to allow for 8k too). Whether or not it works as well at lower bitrates like RED claims their REDcode codec can (even at 10 - 12 bits with 4:2:2), is something to watch for. There probably will be codec shootouts available, though it's too late to change from H.265 in the broadcast world. For me it makes no sense. As now 99.9% of all available to broadcasters material are in same standard (more or less). TV manufacturers now entered last and bloody battle were winner is known already, and two big future losers now fight for smartphones and tablet markets (with same longtime winner, unfortunately for them). From what I gather, they're hoping H.265 will be some sort of panacea (and is supposed to allow for 8k too). Whether or not it works as well at lower bitrates like RED claims their REDcode codec can (even at 10 - 12 bits with 4:2:2), is something to watch for. H.265 will be more effective, but not so much. And it must be especially noted that all broadcasters will start optimizing resource usage and packages due to falling income (and it'll be steady process).